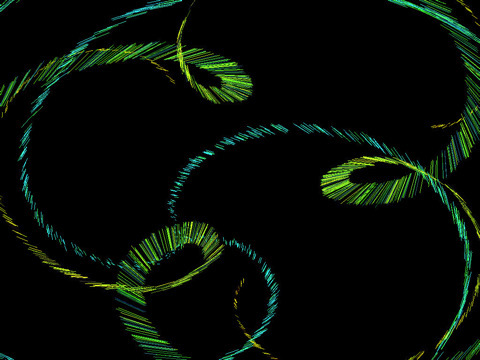 uzu is an iPad app that is described as a kinetic multitouch particle visualizer. So you might be asking, What does that mean? No its not a vuvuzela! Perhaps the exact opposite in terms of its tranquil calming effect. You know those electro globes you see at the mall that respond to your touch? Well think of something like that but with much more dynamics and options on your iPad screen. An exciting blend of physics, fireworks, lava lamp and visual finger gaming action. It’s the sort of thing you might want to have at your next party suspended from the wall using an iPad wall mount, or sitting on a stand to hypnotize your guests. When you open up uzu you start seeing a star-field of particles flying around the screen. Touch the iPad screen with anywhere from 1 to 10 fingers to see all the possible things you can do with uzu. Using 5 fingers you can semi-suspend the movement of the items while using 10 fingers your can actually freeze the action. Now with 10 fingers on the screen, moving them vertically changes the colors used on the rays of light, and moving them horizontally changes the thickness of the rays of light. One major missing point in uzu is the lack of audio sensors. It would be really awesome if uzu had a music mode, where you could enable it and have it respond to music playing on the iPod on your iPad. Otherwise Uzu is truly one of those gotta have it iPad apps for the sake of its originality and entertainment level. You might get tired of playing with uzu one day, but not for a long time. AppSafari review of uzu was written by Joe Seifi on July 7th, 2010 and categorized under App Store, Fun, Games, iPad apps. Page viewed 4578 times, 2 so far today. Need help on using these apps? Please read the Help Page.